When I learned that Hester was going to cook hutspot for our visit, I was pleased. 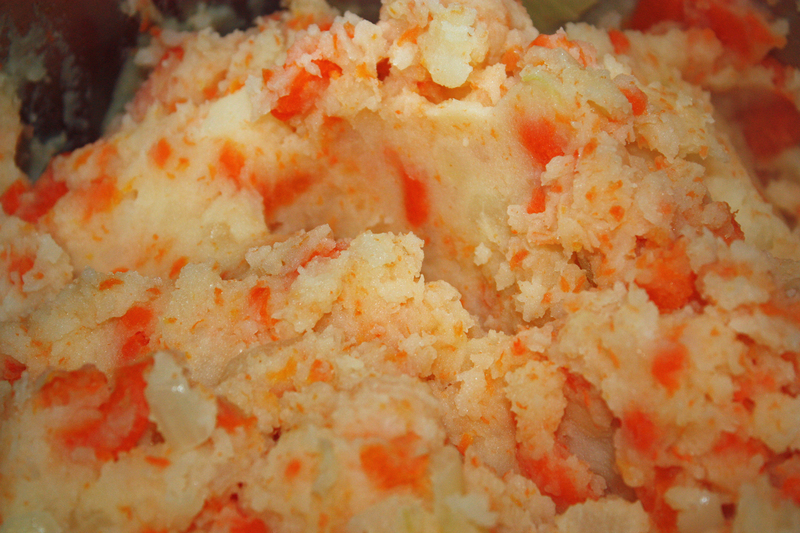 Mashed carrots and potatoes aren’t so exciting on their own, but together—well, not that exciting, but it is the taste of home for me. Given a choice, I’d rather have carrots and onions with my mashed potatoes than potatoes on their own. Hutspot is a type of stamppot. 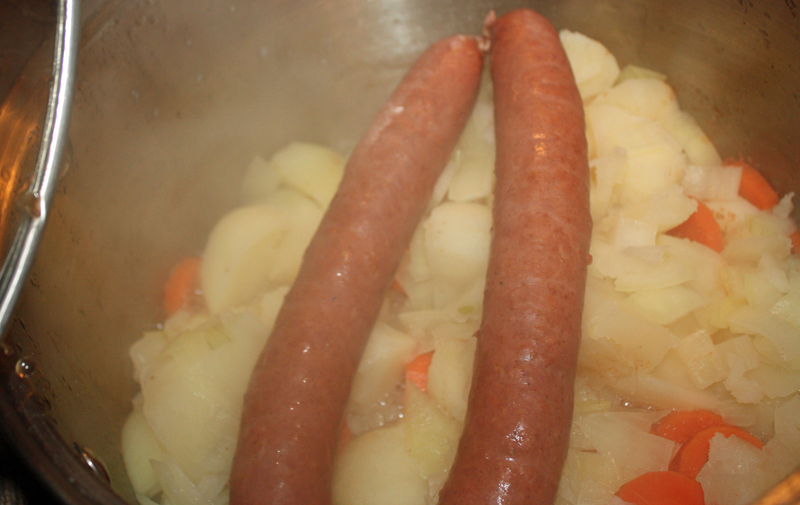 While a lot of Dutch people prefer boerenkool, hutspot is my favorite—and yet I rarely make it myself. 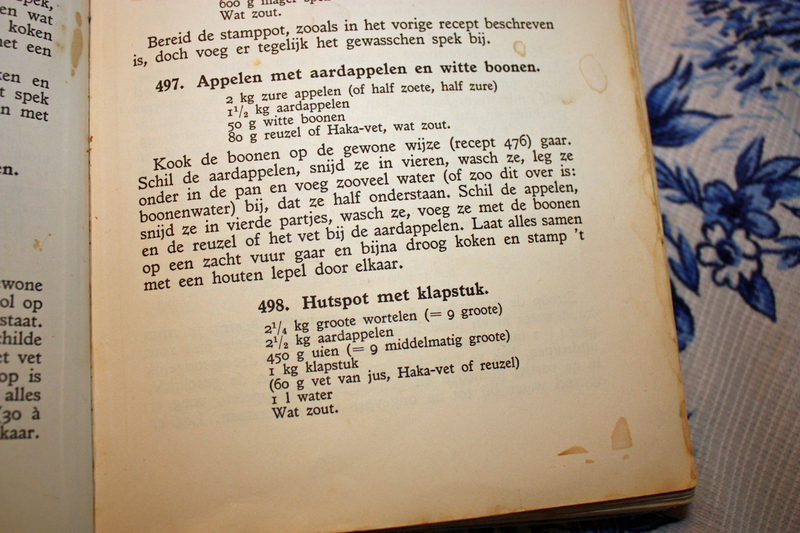 Learning Hester’s hutspot recipe is much like learning my Dad’s boerenkool or snert. She uses terms like dollop of butter, and a few inches of water. So when you make this, use your instincts and adjust these amounts as you like. There’s almost no way to make it wrong. You can even change out the carrots for turnips, parsnips, or another root vegetable. I learned a new technique from Hester: cooking the potatoes and carrots with just a few inches of water in the pan. She says this is how her mother would make it, cooking it dry, she said. This way the potatoes and carrots are steamed rather than boiled. She tells me that she’s used too much water this time although it is still a lot less than I would have used. “I cook like a Canadian now!” she says with a laugh. The final result is a decorative mound of orange and white. We ladle over gravy and eat our sausage with Dutch mustard. It’s a simple, hearty meal to make; I really ought to make it more often. Peel and cut up the potatoes and carrots. Place in a large pot with a couple of inches of water. Cook potatoes and carrots, covered, over medium heat. The cover will create a steamy environment in the pot. Watch the water level so it doesn’t cook completely away. Add the chopped onion about halfway through cooking. Shortly before potatoes and carrots are done cooking, lay the sausage on top of the pot to heat through or heat separately just before you are ready to serve. Make a generous amount of your favorite gravy. When the potatoes and carrots are done, set aside the heated sausage and drain any remaining water from the pot. 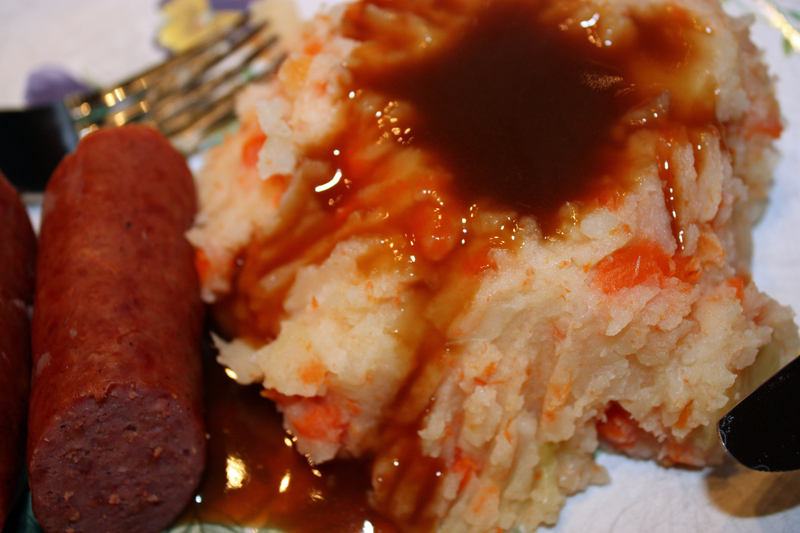 Mash the potatoes and carrots, adding butter until it reached the texture you like. 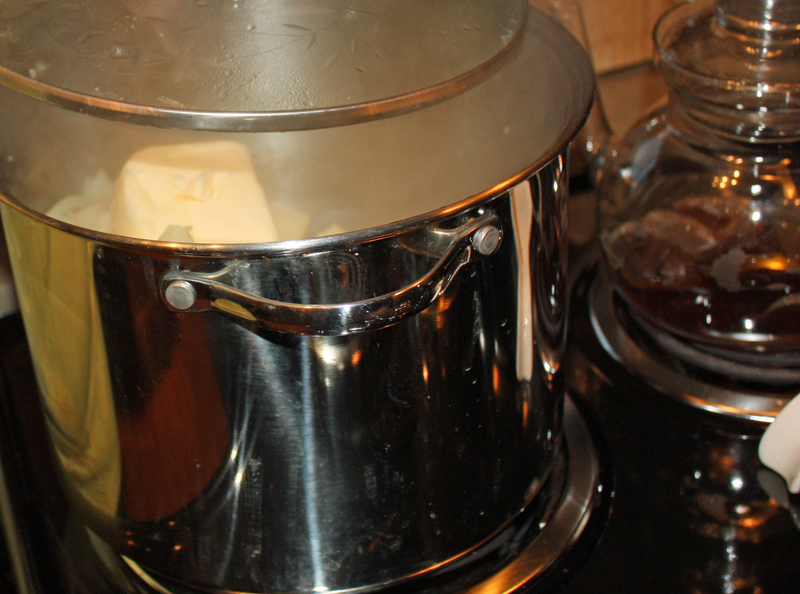 Adjust amount of butter as needed. 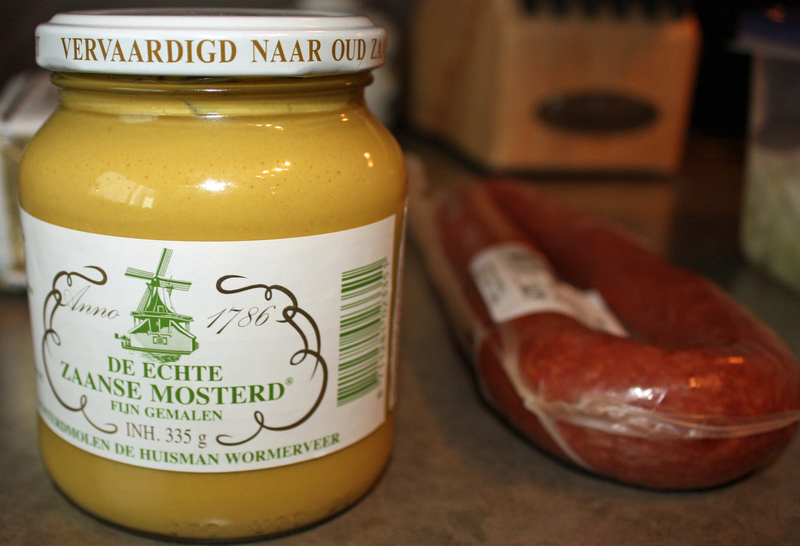 Serve with cut up sausage with a nice Dutch mustard.